The elementals are really busy here in Hawaii and you can help. 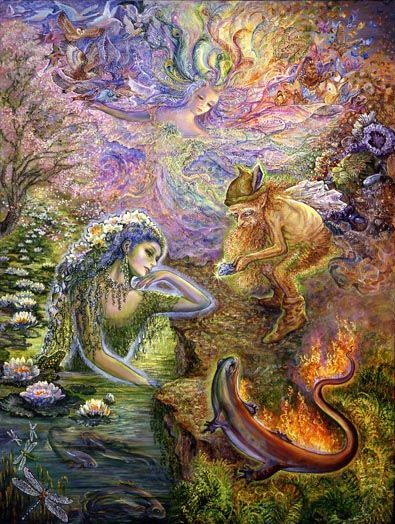 We have the fire elementals (called salamanders) and the water elementals (called undines) that would love to have you send calming thoughts to them. They are responding to human emotion and karma on the planet from tourists and those living in the area. Earthquakes are on the verge of causing a possible volcanic eruption. These elementals do not have free will choice and are responding to human behavior. They listen to the needs of humans. Send them love, ask them to calm themselves. Call on the air elementals (called sylphs) to help move the storms away from the islands and to drop the rain in the ocean instead. You do not need to be psychic. You just need intention through prayer. All of this is really helpful. If you live here on the islands, this is not a good time to ground. Wear your rubber slippers.